Never be far from relaxation with this sofa side table. 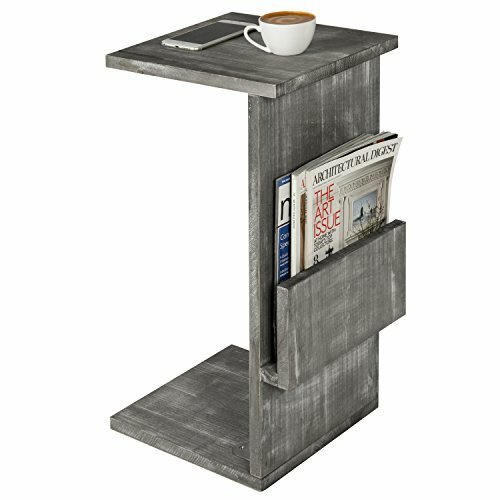 Its C-shape allows this end table to easily slide under your couch to make grabbing a drink, snacking, or setting up your laptop a breeze. A rustic whitewash finish and durable wooden construct make for equally amazing decor. A small pouch on the side of the table is perfect for magazines, T.V. guides or storing media remotes. Comfort and classy style in one perfect side table. Approximate Dimensions (in inches): 24.0 H X 13.0 W X 12.0 D.
Antique inspired wooden side table with a whitewash finish. Features a C-shape design, a magazine pouch with a secure base that can easily be slid under any couch. Perfect for eating, drinking or relaxing on your couch with a close tabletop at hand.